Based on reviews from 45,744 users. Learn how our rankings work or see our guide to white Puma sneakers. Updated Apr 2019. Sneakers that are black, blue, red, yellow, orange, brown, grey, or green are generally stylish or trendy, but the white ones are the most versatile that most sneaker enthusiasts own at least a pair of white kicks in their closets. White sneakers are everywhere, and it seems like they are not going anywhere anytime soon. They have been going around the fashion scenes for a long time now, being worn frequently by influencers, fashion bloggers, and A-list celebrities. The white-colored sneakers are fashionable, flexible, and comfortable, which probably the primary reasons why they reigned supreme over the last few years. Because of the market’s demands for white sneakers, sneaker brands like Puma, Adidas, Nike, Reebok, Keds, Skechers, Converse, and more continuously come up with white renditions of their classic models and release new silhouettes in white colorways. Scroll down below to find some of the best white Puma sneakers. All-white sneakers are a sure win, no-fail footwear of choice for casual use or whenever you want an effortless but still fashionable outfit. They are highly versatile and can be styled in various ways regardless of season, which is, perhaps, one of the reasons why the all-white sneaker trend has been going around for a long time now. With their influential presence in the fashion scene, this trend looks like it’s here to stay. In this section, we list down some noteworthy all-white Puma shoes that released recently. Undoubtedly one of the most popular, if not the best, Puma shoes ever created is the Puma Suede. Although initially designed for basketball, the Suede's functionality combined with no-fail style made it a top favorite even outside the walls of the sports community. It was the it shoe in hip-hop culture during the ‘80s, favorite footwear of choice by the B-Boys for breakdancing. And to this day, 50 years after its debut, the Suede remains relevant and continuously proves why it is an iconic classic. This version of the Suede features an all-white look that radiates an all-out retro vibe. Its modern spin gives the nod to the original's signature features – narrow tooling, lateral Puma Formstrip, lace closure, and premium Suede upper. It also comes with a commemorative Puma Suede 50 shoe box, as it is a part of the classic’s 50th Anniversary celebrations. The shoe retails for $110. These all-white Puma sneakers, along with its gold colorway counterpart, released in June 2018 as part of the Puma Classic Suede “Made in Italy” Pack. The Puma Basket Classic LFS is one of the countless modern-day renditions of the classic Basket silhouette. 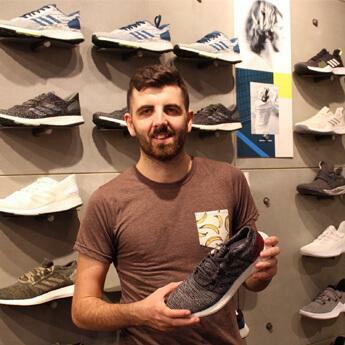 It flaunts a minimal and street-ready look that some purchasers see it as a great alternative to the Adidas Stan Smith shoes. This low-top Puma offers lots of colorways with white being the dominant color on the upper, making it an ideal summer staple for many. It also released in an all-white variation or the "White/White" colorway. The LFS stands for Lace-up Fashion Sneakers. The Puma Basket Classic Canvas, as the name suggests, is the canvas version of the original Puma Basket. And like most Basket versions that released recently, this one’s “White Mono” colorway also joins the lineup of all white Puma sneakers. This lightweight, breathable Puma Basket rendition retails for $65. Released as part of the Puma Tsugi line is the Puma Tsugi Jun shoe. It is an updated version of the Tsugi Shinsei silhouette and introduced in 2017 with the help of Puma brand ambassador and music artist The Weeknd (who also happens to have a collaboration with the brand). Each pair retails for $110. Countless colorways have been released since then, including the "Puma White/ Puma White" colorway which falls under the all-white Puma shoes category. Another shoe from the Puma Tsugi collection joins our list of all-white Puma sneakers, the Tsugi Apex. This monochromatic “Puma White/ Puma White” colorway low-top from Puma exudes a minimal aesthetic that one can comfortably wear in style on the streets or for casual functions. These Puma white shoes are offered for both men and women. The "Puma White/ Puma White” colorway of this soccer-inspired sneaker from Puma is an affordable pair to get if you are looking for a pair of all-white Puma shoes ideal for casual use. The Astro Sala from Puma is comfortable and low-key and, at the same time, stylish. It released as part of the Puma Classics collection and offers sizes for men. These Puma white shoes are made for the ladies for an affordable price of $80. It blends the original Suede's classic look with modern, feminine details for a cool look that can turn heads while still being functional. The Puma Suede Heart Arctica white sneakers are in women’s sizing from 5.5 to 11 in B Medium width. The Puma Suede Black Sole is one of the few Suede iterations that one can easily distinguish from afar because of its black sole unit that perfectly contrasts the minimalistic white suede upper. These Puma black and white sneakers, which first released in 2017, retail for $65 a pair. Other colorways are also available, including blue and red. Included in the well-liked Basket collectionhttps://runrepeat.com/ranking/rankings-of-puma-basket-sneakers is the Puma Basket Bow sneakers. It released on September 13, 2018, as a women's exclusive model in several colorways including white-based ones such as “Puma White/ Puma Black,” “Puma White/ Winsome Orchid,” and “Whisper White/ Puma Aged Silver.” The shoe was also a part of Puma’s Do You campaign. If you are looking for a pair of pink and white sneakers, then try considering the leather model of the Smash from Puma in its “White/Pink” colorway. The tennis-inspired Puma kick boasts a retro look, and its pink touch adds a bit of feminine aura to the shoe’s sporty roots. It is affordable, durable, and easy to clean. The Roma silhouette in “White/ New Wavy” and “White/ Clemantis Blue” colorways fit in the category of Puma shoes in blue and white colors. The Roma, which first released in 1968, was one of Puma’s best shoes made to perform for track and field sports. It was re-issued in the 2000s with an improved design, particularly with a padded tongue, improved arch support, and use of synthetic leather on the upper. The Puma Clyde Pride is a 2017 limited-edition rendition of the 1973 Clyde silhouette. It released just in time for the Pride Month to commemorate the LGBT community. With its colorful, rainbow-themed sole unit that perfectly complements the white upper, the Puma Clyde Pride won’t be hard to miss. Puma sneaker collaborations are no exception to the white sneakers trend. In this section are just some of the white Puma shoes produced under collaboration projects with known designers or streetwear brands. Scroll down below for more information. Rihanna’s collaboration with Puma is full of exciting sneaker models that have captured the eyes of many. One of these is the Puma Fenty Creeper, a low-top platform sneaker that released on April 5, 2017. Its “Puma White – Black – Puma White” colorway is ideal for those looking for a pair of fashion-forward and edgy Puma white sneakers in women’s sizing. Stampd is an American streetwear brand founded in 2011 by Chris Stamp. Part of its collaboration with German footwear brand Puma is the Puma x Stampd Clyde shoe, which released in 2016 with a street-ready aesthetic. Its “Whisper White” colorway makes it to our list of white Puma sneakers. The Puma x Sophia Webster Candy Princess launched as part of Puma x Sophia Webster collaboration's second drop. Sophia Webster, a British footwear designer who is known for her hand-drawn designs, took the Basket platform shoe and transformed it into a new playful and chic Puma model. This Puma Basket rendition initially retails for $140 each pair. 1. Where can I buy white Puma sneakers? White Puma sneakers can be bought from Puma stores and official website. They are also available in sneaker retailer shops both in store and online. Likewise, white Puma kicks can easily be found here on RunRepeat. 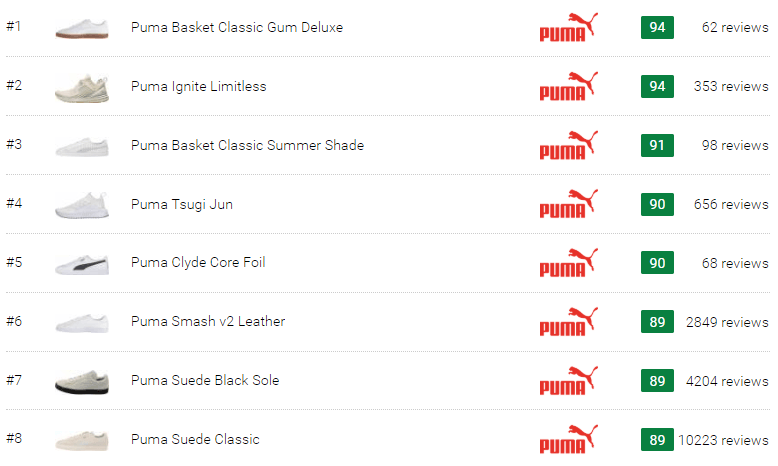 Just go to the sneakers main page here: and use the “Puma” brand filter + “white” color filter at the left sidebar of the page, and you will be directed to a list of currently available white Puma shoes. 2. Any tips on how to style white Puma shoes? Wear your white Puma sneakers to tone down a bright tonal outfit. White Puma shoes are great summer staples. You can pair them with floral dresses to complete your summer look. For a classic and no-fail look, wear them with a combination of white tee and jeans. Chunky white Puma sneakers look great when worn with mini dresses for a girly-meets-sporty look. Another way to style your white Puma shoes is to pair them with socks that match the rest of your outfit for an added statement. 3. How do I wash my white Puma shoes? Remove any excess dirt on the surface of your white Puma shoes. You may use specialty products like suede or leather cleaning kit to clean sneakers that are made of such materials. Likewise, soap and water solution together with a soft brush can also be used for cleaning. Avoid using harsh chemicals like bleach as they can cause damage to your white Puma sneakers. Use baking soda to remove bad odor from the insoles. Remove the laces and wash them with soapy water. Once done cleaning, allow your shoes to air dry. 4. How can I keep my all white Puma shoes clean? One downside of owning a pair of all-white Puma sneakers is that they can be hard to keep clean because of, well, their white color. And one of the best ways to keep them in pristine condition is by maintaining their fresh look. To do so, you can use a shoe protector spray before wearing your white sneakers for the first time. It will protect your shoes against dirt, water or any other liquid material, stains, and creases. 5. What are some of the most affordable Puma shoes in white? 6. How about the most expensive Puma sneakers in white? 7. I am looking for white high-top sneakers. What are examples of Puma white sneakers designed with a high-top profile? 8. What are some examples of white Puma casual shoes that have a slip-on construction? 9. What other sneaker brands offer white sneakers for women? Several sneaker brands share a wide selection of white sneakers designed specifically for the ladies, including Adidas, Nike, Keds, Skechers, Reebok, Gucci, and Converse. 10. What are the common sneaker technologies used in Puma white shoe models? An upper technology that comes in woven material and provides a lightweight, supportive, and flexible fit. Cushioning technology made of polyurethane foam in lieu of EVA material. It allows superior energy return. A customizable lacing system that permits a customizable fit for the wearers.